They’re more natural and engaging than websites or forms. They humanise your marketing …again. The open and engagement rates are incredible! 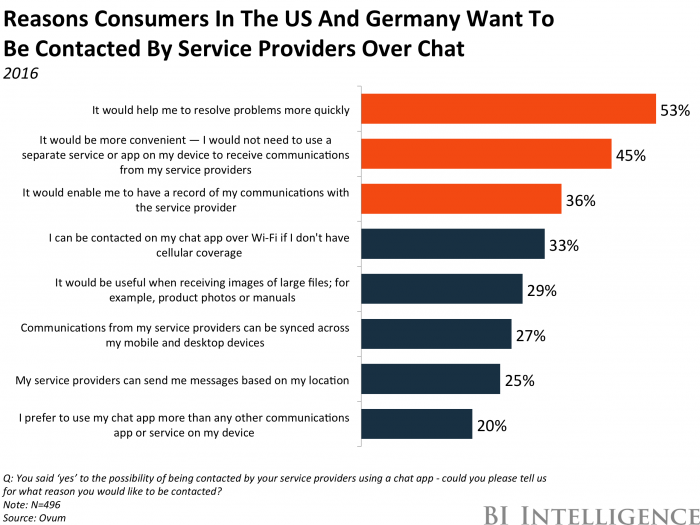 The demand for live chat is growing and if you haven’t started looking and integrating Bots into your marketing its the time to get started and turn leads into customers with chatbots. 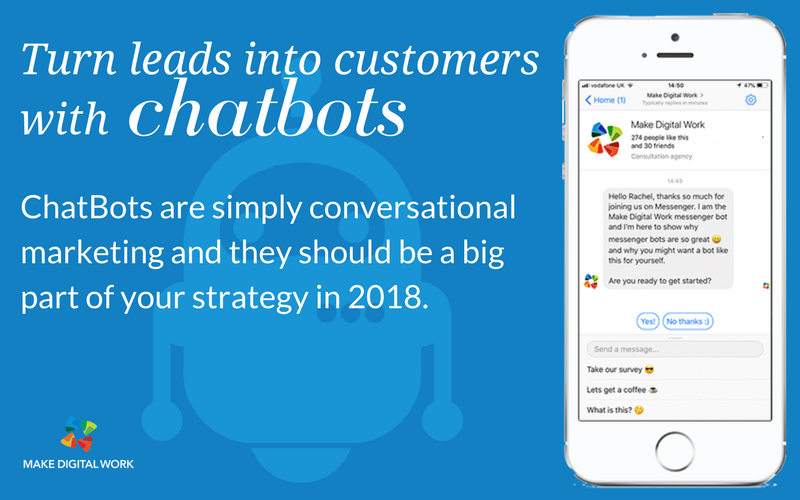 ChatBots are simply conversational marketing and they should be a big part of your strategy in 2018. Because your customers and prospects want them: As consumers we want answers now, and research says 40% of consumers don’t care where they get their information from. Human or robot, it doesn’t matter, so long as they get the help they need. Email open and engagement rates are falling while open rates are as high as 90% in messenger. Between 2015 and 2016, ecommerce purchases through WeChat more than doubled. It’s just hands down one of the most efficient ways to segment your audience so you only talk to them about what matters to them. Turn ups to webinars increase by 45% when you run them through a messenger bot. They fit any size of company, from a startup to enterprise, for instance Its estimated that banks will automate up to 90% of all their support via chat bots by 2022. Stop answering the same question over and over again: Create a bot to answer the most asked FAQ’s. Get rid of static web pages and boring form filling. Lets face it we can be on social media talking to prospects but what happens when you have a visitor on your website? Most reporting tools are retrospective, that means we don’t connect with visitors to our site, and as we are all in a hurry today, browsing a site to find what you need is a pain, so how can you ask them what they want and solve their queries instantly? Chat. I loved this survey that I read recently that said 80% of the companies they talked to believed that they offer excellent customer service, only 8% of prospects believe they received excellent customer service. That’s a big gaping hole… and the quickest way to improve service is with quick responses, and having some sort of 24/7 support. We are all using chat already from talking to friends on Whatsapp, Facebook messenger is growing year on year, Slack is used widely to collaborate… so the shift is happening and you need to start using them as a business tool – or fall behind. Another massive plus for Chat is that people love to talk about themselves, be asked questions and feel listened to… Chat bots make your prospects feel heard. That means they feel important and that means they know you care. That drives brand loyalty and that in turn drives sales. We like small digestible chunks of information, about the topic we are interested in, not wading through pages on a website – this means you can take your existing funnels and redesign them as chat funnels and compare. Let’s face it, we want conversations when we have time to talk, on the device we are on and most of us tend to be on mobile. Forrester Research reports that 86% of millennials they spoke to would like brands to use ChatBots to promote deals, products and services, and 67% say they’re very likely to purchase from a ChatBot. Account management: Being on hand, especially on a B2B level, to answer common queries and concerns that clients have. Events: ChatBots are great at distributing event information, increase signups and remind people of upcoming dates and to send follow ups to get feedback and future dates. Selling online: As mentioned, people can purchase goods and services from ChatBots almost instantly, making transactions more personal. Customer support: Let bots handle the monotonous stuﬀ so sales reps and marketing teams can focus 100% on tasks that require a human touch. Research: ask questions to establish your target markets challenges, develop solutions to solve them and market to the right people. Run Webinars: and improve attendance by up to 55% AMAZING! Run competitions: When launching a new service or product, give people a chance to win it, create an audience you know is interested so when you launch you can make them an offer. Delivering excellent service is something we all aspire to, however delivering instant service and reducing slow response time is the most effective way to create a better customer experience. Instant response is seen as a given for users in this automated age, and one of the quickest and most cost effective ways to achieve this is with Chatbots and live chat software. Give it go! We can look at process that need improving, it could be an increase in leads, getting reviews and feedback, to getting existing customers to spend a little more. We look at the various technologies to see the what BOT technology will suit you and your business best. Develop an overall blueprint. We look at each and every flow that needs to be handled by the bot, add copy and images, look at assets to add etc then test with humans. Build and tes … test some more… add integrations… at all times we show what we we are doing and when we expect it to be launched. Add updates, new flows, grow subscribers, improve open and click rates and offer Tech Support. Do you want to training your team on BOT Building? No problem let’s talk.